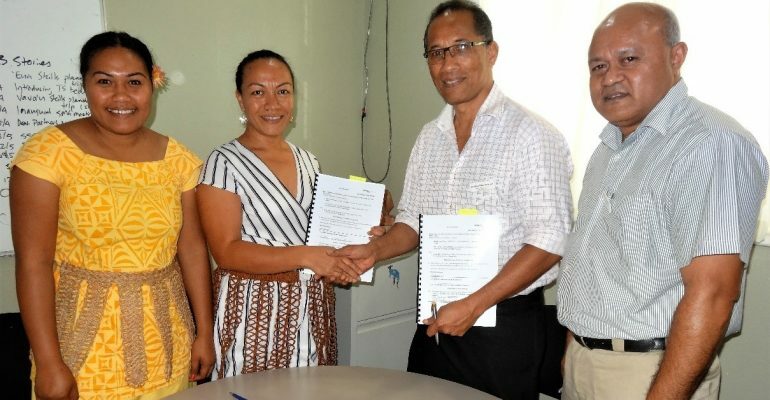 In an important milestone for the Tonga Skills program, the first contract for skills delivery by a training provider has been signed with Tonga Youth Employment and Entrepreneurship (TYEE). Under this agreement TYEE will provide a Readiness for Work program for 20 unemployed young people, place them in existing job vacancies and support them in their first weeks of employment. The skills activity will include identifying existing job vacancies, selecting appropriate young people for the jobs, briefing their parents, 2 weeks training, application and interview support, and on-the-job support for the employers and the new employees. “It is exciting that this Australian Government program can fund such an innovative program as one of our first pilot activities,” said the Tonga Skills Team Leader, Dr Fasi. The agreement was signed by Ms Lusia Latu-Jones, President of Tonga Youth Employment and Entrepreneurship and Dr Uhila-Moe Langi Fasi, Tonga Skills Team Leader (pictured).